Here is the deal. If you are a bank and you provide residential mortgages, you have limited incentives to keep those mortgages on the your balance sheet. In particular, if a mortgage is conforming, you might as well sell it to the GSEs (Freddie Mac and Fannie Mae) and just keep the fees. Because if you keep it on your balance sheet, the Fed's stress test will hit that mortgage quite hard with a 21% drop in housing prices. And that's on top of bank capital rules. So you'd need a chunk of capital to support that position (as we saw today). But you still want to have assets on the balance sheet because cost of funding is at historical lows, and anything that throws a reasonable coupon can generate some nice interest income (carry). All those mortgages sold to GSEs are financed with Agency bonds that have similar characteristics to a portfolio of mortgages with a few differences (and of course a lower rate). 1. Agency bonds are extremely liquid particularly compared to a pool of mortgages (whole loans). 2. 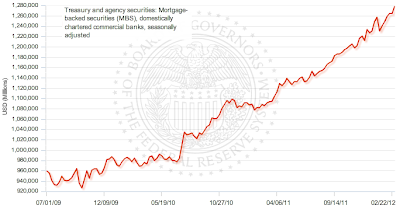 Agency bonds have an implicit government guarantee (or at least that's the market's perception). 3. Most importantly agency bonds don't get hit nearly as hard when the Fed's stress tests are applied. So why hold loans when you can sell them to the GSEs and then buy back a liquid security with similar characteristics and not worry about stress test or credit risk much. Yes you give up some yield, but your funding costs are so low, you can still make money. And that is exactly what banks have been doing. 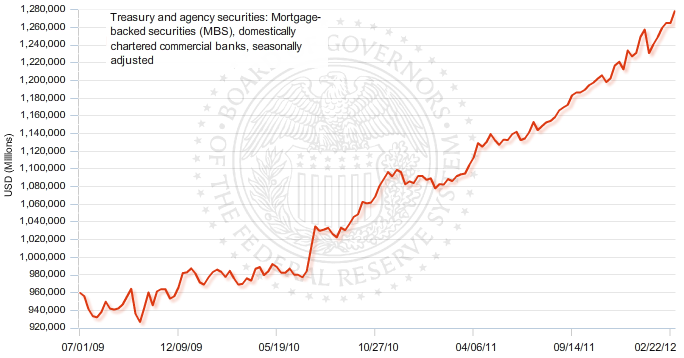 The chart below shows Agency MBS paper held by US banks over time. That's one great "carry trade".